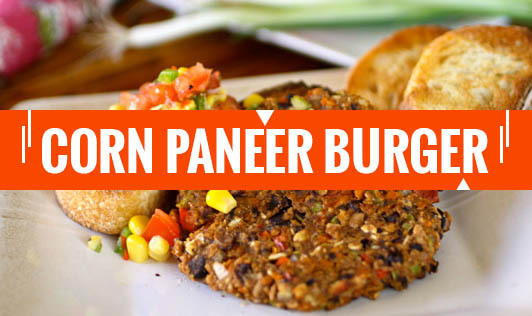 Here is a recipe of a tasty burger with crispy lettuce, freshly sliced veggies and a cheesy corn patty along with paneer and coriander your kid would relish. 1. Combine all the ingredients in a bowl and mix well. 2. Divide the mixture into 2 equal portions and shape each portion into a 3" diameter round. 3. Dip each patty in the maida-water mixture and roll in the bread crumbs till they are evenly coated from all the sides. 4. Heat the oil in a kadhai and deep-fry each patty till it turns golden brown in colour from both the sides. Drain on absorbent paper and keep aside. 1. Cut each burger bun horizontally into two. Apply butter on both the sides of each half of the burger bun and toast them lightly on a tava (griddle). Keep aside. 2. Place the lower half of the bun on a clean, dry surface and apply ½ tsp of mayonnaise on each bun halves. 3. Place an iceburg lettuce, 1 patty, 2 tomato slices and 2 onion slices and sprinkle a little salt and pepper over it. 4. Cover with the upper half of the bun and press it lightly.